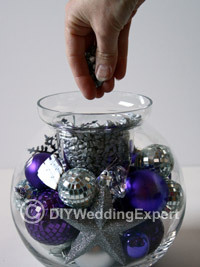 Here is a very easy DIY Christmas wedding centerpiece tutorial. This great design makes really effective table decorations for any brides planning a wedding over the Christmas holiday season. 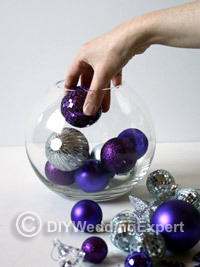 You can easily combine your own wedding color theme into this wedding centerpiece by choosing baubles in your wedding colors. 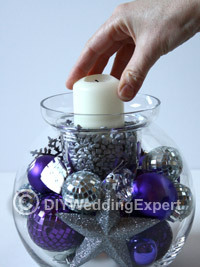 I also love the way this arrangement features a candle, as candlelight is so romantic for winter weddings. 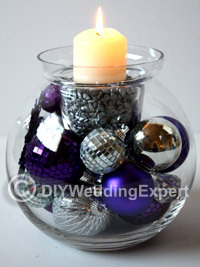 An 18cm glass bubble ball with inner vase. A selection of baubles in your own wedding colors. I’ve used different shaped ornaments to create interest and texture. A chapel candle. I used one that was 75mm x 50mm. Gravel in a color of your choice. I used fine silver gravel stones. 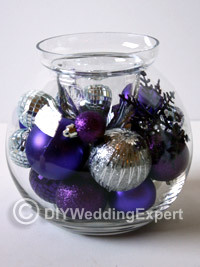 Start by placing a random selection of your chosen baubles into the bubble vase. Make sure you mix up the colours and textures to create interest. Place the inner vase on top. 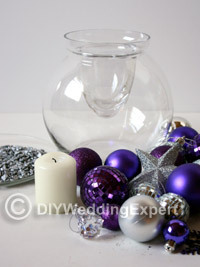 I normally sneak a few smaller baubles in as I add the inner vase so that the decorations fill the vase. Place your colored gravel into the inner vase. I usually fill the inner vase so that it’s two thirds full. Place your candle into the gravel, giving it a little twist so that it sits securely. That’s it! How simple but really effective is that. 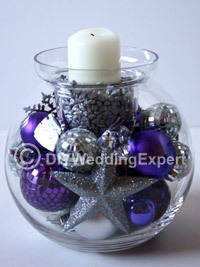 A perfect DIY Christmas wedding centrepiece that can be made well in advance of your winter wedding.